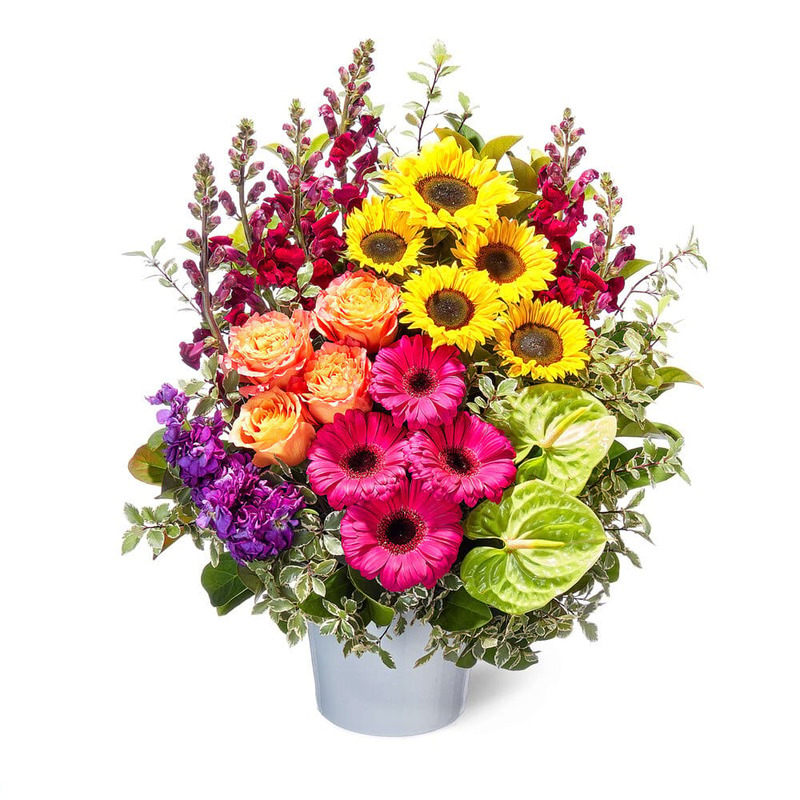 Just like the `Girl from Ipanema`, our super bright, fun, tropical and wild flower arrangement is guaranteed to turn heads and make everyone it passes go `aaaaahhhh`. Displaying an abundance of multi-coloured blooms including golden sunflowers, tropical lime anthurium, colourful long-lasting orchids, gerbera daisies, roses and exotically perfumed pink oriental lilies, this vibrant flower arrangement n a re-usable wooden crate will liven a hospital room, colleague`s office or home. 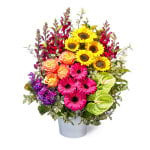 Simply order these lush, colourful flowers online or phone our friendly consultants toll free on 1800 66 66 46. 2017-01-23 Service rating : Delivery arrived more than 2 hours later than vip expensive early delivery ordered, but delivery fee was refunded on request when early delivery service was not provided as paid for. Worked out fine after recipient was phoned & she went straight home to get flowers left at front door. Product : As pictured, excellent quality. 2016-05-19 Service rating : Great service and reliable delivery. Product : Great product just bad service on delivery nothing else offered for drivers mixup with no contact! Product : Beautiful flowers. Great quality. 2015-10-20 Service rating : Really good service, easy to use website. Communication was alright. I knew when the product was delivered, however I got the notification 24 hours after it was delivered. Product : Beautiful flowers!!! I got the what was pictured. The flowers were vibrant and are still alive 2 weeks on. My favourite product by far! 2015-08-18 Service rating : Item was delivered when requested and without any damage from what I could tell. I`m very pleased with the service. Product : The arrangement was exceptional and the recipient flabbergasted! Well done! 2015-06-15 My sister loved her flowers, they looked amazing - fresh and beautifully presented at a reasonable price. Thank you! Will be using you again in the future! 2015-05-13 Flowers for Everyone has always delivered on time and have sourced the freshest flowers! Everyone who has received flowers from here have commented on how nice they are. And it`s all hassle free from the comfort of home! they delivered the flowers prior to lunch time as requested. Product : The yellow roses were a bit disappointing as they had brown edges and were quite opened. The rest of the arrangement was very nice. 2015-03-04 Service rating : Lady on the phone was very helpful and flexible. was able to provide the style I liked at the price I felt fit my budget.